David O'Brien deftly fits the monumental and mysterious into CCA's smallest gallery in his recently extended solo exhibition "In The Garden of Externalities." Explore the show step-by-step, from the lobby of CCA Cinematheque and across the gallery to its far reaches. 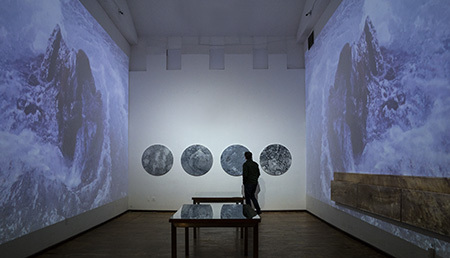 What you will see are two projections filling opposite walls of the space, looping mirrored videos of a craggy stone that's caught in the runoff of an Icelandic glacier. It's a dizzying gauntlet, as the icy blue flow fills your peripheral vision and sends imaginary crosscurrents through the air. Four art objects are aligned on the far wall. They are dark, glittering disks of ambiguous dimension and as you approach, the eye slides across them for clues to their true volume and position in the room. Are they hovering free of the wall, or fixed to it? Are they flat, or shaped like lenses? Is that real texture or trompe l'oeil? The experience conjures memories of Tacita Dean's "The Green Ray." In that piece, a setting sun draws you through a spiritual quest that hinges on a single frame. Here, moving images heighten your sense of temporality while strange moons tow you in with irresistible, anchored gravity. O'Brien pulls off this astonishing feat in a space that measures no more than twenty paces. The artworks are, in fact, screen prints made from digital images of garbage. The New Mexico artist embarks on road trips across the West in search of mundane ruins, photographing patches of earth strewn with castoff cultural artifacts. In his studio, he transfers the images onto panels using numerous layers of acrylic, resin and metallic pigment. At the end of such a spine-tingling journey, this discovery feels like a political prank. The glaciers are melting away at a startling pace, but abandoned hunks of plastic and metal will hold their manufactured shapes for centuries to come. However, there's something about these images that dodges acerbic environmental activism. O'Brien's prints have a studied, painterly quality to them. In this series, he scatters fine glitter through the compositions, giving them the feel of precious relics. There's dark humor here, but also an honest fascination for humanity's interactions with the natural world.